NICK’S Window Cleaning has been offering its services for the cleaning and repairing of gutters for more than ten years. Rain gutters should work properly for the proper drainage of rain water. Our workers are expert in repairing all sorts of gutter-related problems. Our workers are well trained and highly experienced in this filed. Our workers have WSIB coverage and our company has full liability insurance. We offer the most affordable rates along with quality work, completed in timely manner. We are expert in dealing all sorts of gutter-related problems ranging from simple leakages to failed joints. Due to faulty installation or any other problem adding strain on seams, they may fail. Some other reasons for gutter seam failure are wearing away of its material, rust or corrosion of the surfaces etc. Seams fail when the sealing compound in them deteriorates. Our team is expert in seam repair which can be done by mending the joints. If seam repair is not done in time it can cause complex problems such as flooding, filthy water leaking in the walls and moisture accumulation in foundations. Seam repair is the most efficient method to resolve all leakage problems. Gutter maintenance is a very important job which can’t be done by an inexperienced person. If you inspect your gutters by yourself, you may not notice many little problems which can turn into bigger threats over time. Many people deliberately ignore some problems, like sagging, unless their gutters fail completely. If you ignore small problems in your gutter system, they will eventually turn into bigger problems sooner or later. Regular gutter maintenance and routine inspection will increase the efficiency and the lifespan of gutters. The experts from NICK’S Window Cleaning are trained in dealing with sagging and other problems caused by timely usage. Gutters should be inspected at least twice a year. It has been observed that gutters of large residential or commercial properties wear out at a greater rate than the normal gutters of homes. These gutters bear more load due to more usage than the normal home gutters, especially due to falling leaves in winter. That is why they need regular inspection and more frequent maintenance, otherwise they will fail before reaching their age. Our experts are skilled at cleaning and repairing gutters of large commercial properties. We have treating gutters of large facilities throughout Thornhill for many years. Contact us to find out more about our commercial services. 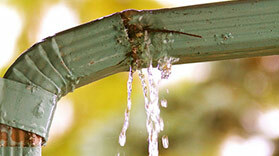 Rainwater gutters require proper inspection and maintenance for their proper functioning. They are in direct contact with the pollutants, dust and dirt. They should not be left for the accumulation of falling leaves or debris. If they are clogged with the dirty mass, it may result in sagging and failing of joints. Even the smallest problems in the gutter system should not be ignored. If the issues are not resolved in time, the foundation and structure of the building will have to face a serious lacuna. Seam leakage and moisture in the walls will destroy the paint and weakens the material of the wall. Fungus can also grow in such favourable conditions. The appearance and strength of the structure will be affected equally. The proper treatment and repairing cannot be done with inexperienced hands and improper equipment. That is why you should avoid doing this work on your own and hire a professional for it. If you want to get your work done quickly and in reasonable price, then don’t forget to contact NICK’S Window Cleaning Service. We have skilled workers who are qualified for their work. 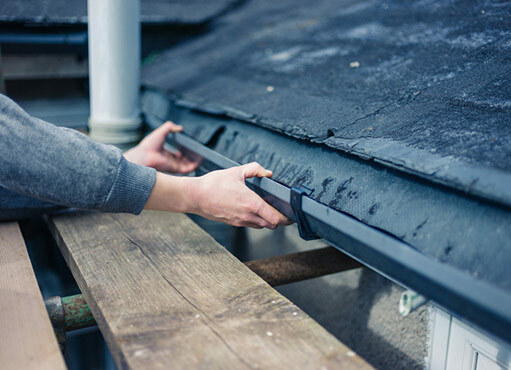 Our workers are experienced in repairing seam gutters, soffits, corner leakages, gutter spikes, sagging gutters, leaking gutters, overflowing gutters, blocked downspouts, leaking downspouts, patching eavestrough holes etc. We have a quick and cheap solution to all your gutter-related problems.